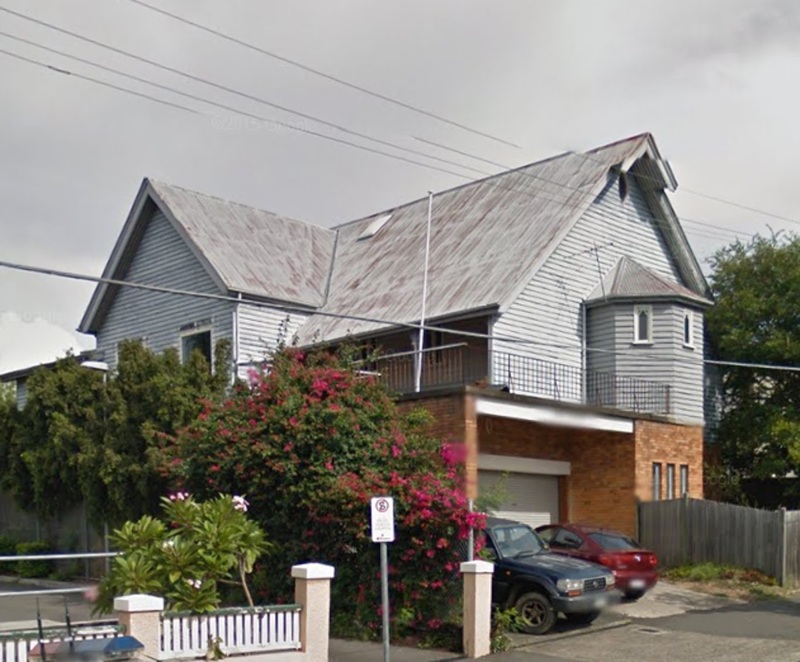 As you drive down Brunswick St into New Farm you see this most striking building on the right, just near Balfour St. Eventually the sign out front gives it away - it is the local Anglican Church, St Michael and All Angels. Here is a current picture of it. 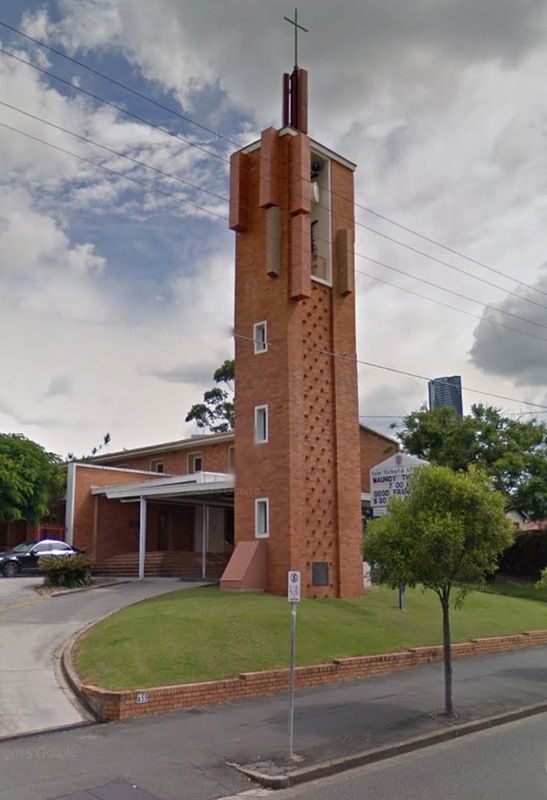 This brick structure was designed by Brisbane architects Conrad and Gargett, and it dates back to 1958-9. It was consecrated by the Anglican Archbishop Dr Felix Arnott in December 1974, although the foundation stone had been laid in 1957. Here is an older, but undated, image of the church. The history of the church and its congregation is far older than this, however. 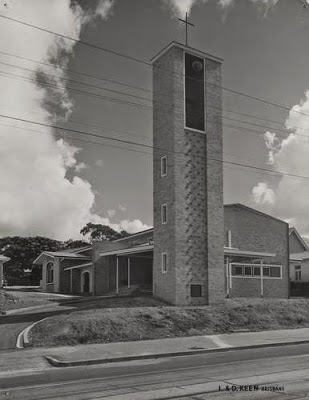 Way back in 1890 a group of New Farm residents met to discuss the erection of a church on land owned by the church in Brunswick St. At the time New Farm Anglicans were members of the congregation at Holy Trinity Anglican in Fortitude Valley. That first church was completed in November 1890 but was almost immediately destroyed by fire. 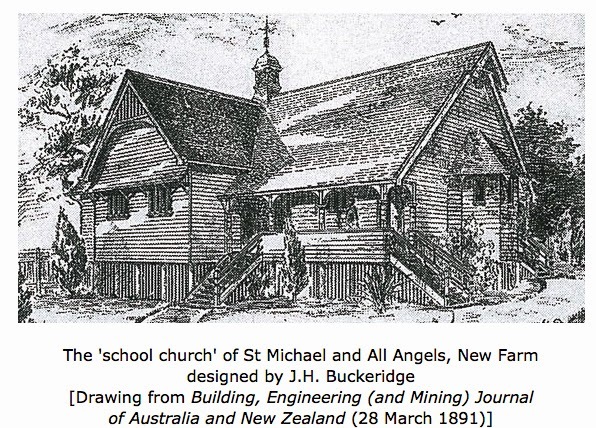 A successor church was rebuilt straight away and dedicated in March 1891. This is what it looked like on completion. When the new brick church was proposed the old timber church was moved to another area of the grounds and placed on top of the newer brick Sunday School. It seems that this building has been separated from the church grounds and sold, now being privately owned. This is what it looks like today. There are a couple of other points of interest about this church. Firstly, the bell used in the lookout tower of the New Farm Fire Brigade was donated to the church and it now sits in the church's tower, although I doubt that it is still used - the pealing bells that I have heard appear to be a recording. Secondly, the church has a columbarium. Don't worry - I had to look it up too. It is a memorial repository for cremated remains. The church's web pages say that it sits behind the church building. I also read on those web pages that the church roof was hail damaged in a recent storm and services are currently being held elsewhere. Let's hope the congregation can get back home as soon as possible. It looks fairly new in the undated photo. I lived in New Farm in the early 1970s and recall a bit more garden in front. Somewhere between 1955 and 1975, according to SQL. That was strange putting the old church on top of the brick Sunday school. Should have been preserved in the grounds by itself.